New evidence from NASA's Chandra X-ray Observatory challenges prevailing ideas about how supermassive black holes grow in the centers of galaxies. Astronomers long have thought that a supermassive black hole and the bulge of stars at the center of its host galaxy grow at the same rate — the bigger the bulge, the bigger the black hole. A new study of Chandra data has revealed two nearby galaxies whose supermassive black holes are growing faster than the galaxies themselves. The mass of a giant black hole at the center of a galaxy typically is a tiny fraction (about 0.2 percent) of the mass contained in the bulge, or region of densely packed stars, surrounding it. 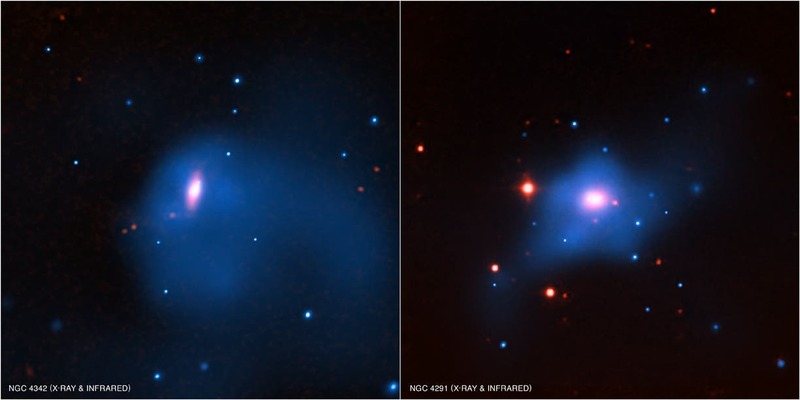 The targets of the latest Chandra study, galaxies NGC 4342 and NGC 4291, have black holes that are 10 times to 35 times more massive than they should be compared to their bulges. The new observations with Chandra show that the halos, or massive envelopes of dark matter in which these galaxies reside, also are overweight. The new study suggests the two supermassive black holes and their evolution are tied to their dark matter halos and they did not grow in tandem with the galactic bulges. In this view, the black holes and dark matter halos are not overweight, but the total mass in the galaxies is too low. "This gives us more evidence of a link between two of the most mysterious and darkest phenomena in astrophysics — black holes and dark matter — in these galaxies," said Akos Bogdan of the Harvard-Smithsonian Center for Astrophysics (CfA) in Cambridge, Mass, who led the new study. NGC 4342 and NGC 4291 are close to Earth in cosmic terms, at distances of 75 million and 85 million light years, respectively. Astronomers had known from previous observations that these galaxies host black holes with relatively large masses, but astronomers are not certain what is responsible for the disparity. Based on the new Chandra observations, however, they are able to rule out a phenomenon known as tidal stripping. Tidal stripping occurs when some of a galaxy's stars are stripped away by gravity during a close encounter with another galaxy. If such tidal stripping had taken place, the halos also mostly would have been missing. Because dark matter extends farther away from the galaxies, it is more loosely tied to them than the stars and is more likely to be pulled away. To rule out tidal stripping, astronomers used Chandra to look for evidence of hot, X-ray emitting gas around the two galaxies. Because the pressure of hot gas – estimated from X-ray images — balances the gravitational pull of all the matter in the galaxy, the new Chandra data can provide information about the dark matter halos. The hot gas was found to be widely distributed around both NGC 4342 and NGC 4291, implying that each galaxy has an unusually massive dark matter halo, and therefore that that tidal stripping is unlikely. "This is the clearest evidence we have, in the nearby universe, for black holes growing faster than their host galaxy," said co-author Bill Forman, also of CfA. "It's not that the galaxies have been compromised by close encounters, but instead they had some sort of arrested development." "It's possible that the supermassive black hole reached a hefty size before there were many stars at all in the galaxy," said Bogdan. "That is a significant change in our way of thinking about how galaxies and black holes evolve together." The study also has been accepted for publication in The Astrophysical Journal.